Protohistory. Divine Events. Human Sources. Cain left the Garden for the land of Nod because he realized he was a liability, which he was, for in a fit of rage he had killed his younger brother. But he became both fearful and remorseful and seeking spiritual advice sought out the counsel of Eve. It was because of his sincere seeking for divine assistance that he became indwelt by an Adjuster. We can also see by the quote below there have been discussions on Cain's sense of guilt and the leniency of Cain's punishment. "But the most remarkable feature of the Septuagint in this passage is that Cain is presented as despairing of God's mercy, exclaiming, "My crime is too great for me to be forgiven." That translation is one possible rendering of the underlying Hebrew, which can also be translated, "My sin is too great for me to bear" or "My punishment is too great for me to bear." Thus, the Septuagint shows Cain in despair, fearing that his guilt will inevitably result in divine retribution in the form of his own violent death. On the other hand, the alternate translations would show Cain either as expressing grief and contrition, or else as complaining about the severity of God's punishment and arguing that it amounts to a death sentence -- but apparently not despairing of the possibility of forgiveness. It is unclear which of these three possible translations is the right one." Although we have been taught what a terrible person Cain was and how pure Able was as the innocent victim what has been glossed over is God's forgiveness of Cain. In the Biblical version God does not outright punish Cain for he is sent away but with a mark of divine protection. He was free to marry and raise a family which is what happened. A true desire to atone for his actions was the turning point of his life. A repentant Cain became an ambassador between the Nodites and the Adamites. He was successful in promoting peace between them. And I think Cain, as an ambassador of good will, was liked by the Sumerians. In the Sumerian tale "Inanna Prefers the Farmer" it is the farmer who is the diplomat and certainly not the shepherd which is much more on target to how things turned out as opposed to other sources. There is a second epic called "The Debate Between Winter and Summer" where Summer is the herdsman and Winter is the farmer. A heated debate ensues between the two as to whose sacrifice is worth more. The god Enlil settles the debate in favor of the farmer. As to the real reason the farmer in both epics is favored may or may not have to do with liking Cain but these first telling of the story are much more accurate than what we have been taught. In these Sumerian epics, the hero is Cain. Cain had a son, Enoch. As Enoch grew up he saw a father trying to promote peace between two groups who did not particularly like one another. Enoch like his father became a great leader of his people. Although Cain had a notorious background, he overcame that obstacle to become a spiritual influence as head of his tribe. It was through his redemption that his life changed. It may be that this particular act of forgiveness, Eve's spiritual guidance and the endowment of the Adjuster, which must have had a profound effect upon Cain, that may be at the root of the so called Venus cult with its various figurines of the goddess. My conclusion based on Sumerian texts is that Eve is Inanna the goddess, the Queen of Heaven, who spawned a long list of mother earth goddesses throughout history. Although this is a bit off topic Cain is directly linked to this cult. "Some experts believed that the Minoan and Mycenaean civilisations worshipped not a number of goddesses, but one, powerful goddess, just like the Israelites worshipped the One God. The worship of the Mother Goddess has existed as far back as the Neolithic period. 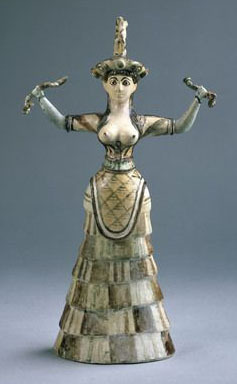 In Crete, the Minoan civilisation had only worshipped goddesses, judging by the number of arts dedicated to them. Though, the Linear B, in the palace of Knossos showed the names of some gods, such as Zeus, Poseidon and Ares, the dating of these writing showed that they were written after the Mycenaeans have invaded and occupied Crete, around 1450 BC." "The most apparent characteristic of Minoan religion was that it was polytheistic and matriarchal, that is, a goddess religion; the gods were all female, not a single male god has been identified until later periods." More information on this subject of the Earth Goddess, Mother Goddess and also called a Venus figure can be found through a link at the bottom of this page to the page The Venus Cult. Enoch, first born son of Cain and grandson to Eve, was more Adamic in his genealogy but was raised in a Nodite culture, the culture of his grandfather. He grew up east of the Garden in an area that would give rise to ancient Susa. Susa is considered as one of the oldest cities in the world. It is in the top five of the oldest continuously inhabited cities. "In the Sumerian records Susa is called the "oldest city." (http://historum.com/ancient-history/56847-southern-mesopotamia-before-4000-bc.html) Both the Urantia Book and the Bible say that Cain married and went east of the Garden to the Land of Nod. "Cain married Remona, his distant cousin, and their first son, Enoch, became the head of the Elamite Nodites." (UB 849) It is the inclusion of the name Elamite that tells us that region of Susa is the "Land of Nod" homeland to Enoch. Pre-Susa as a main Nodite location would also have been close to the long ago devastated Dalamatia (the remnant of which lies in the Persian Gulf) and Dilmun. According to the UB Dilmun was located north and east of the Persian Gulf. That would put it near Susa. Another reason to consider the area of present day Susa as the location of where Cain settled is from the Biblical text, "Cain knew his wife, and she conceived and bore Enoch; and he built a city, and called the name of the city after the name of his son, Enoch." 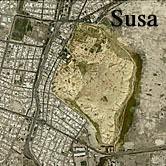 (Genesis 4:17) The only city to the east to arise of any consequence from this early time is Susa. In classical sources geographers after Ptolemy referred to Elam as Susiana. The earliest date of archaeological occupation of Susa as a city is about 4000 BC. The oldest date for cultural artifacts is about 6000-7000 BC. There are claims that certain cities of Sumeria are the cities built by Cain but they cannot be correct. All of these cities are to the south of the Garden. Only a city located to the east would be a contender for "Cain's city". That division of those tribes indicate the homelands of the later Nodites who would become to be known as the Sumerians, the Elamites and the Canaanites (Canaan was the land of the Nephilim, the land of the giants). In both cultures of the Sumerians and the Canaanites can be found vestiges of the Lucifer rebellion and with the probable origin of the Book of Enoch from Elam we find all three areas sharing this common legend. It seems that the Nodites did not migrate very far from home. All three groups are within the fertile crescent. The map on page Van (not the map shown to the left) shows the land of the Kurds, Kurdistan, within the fertile crescent which I conclude is the north and east range of the Nodites. The city of Mosul on the map to the left is the modern name for Nineveh the ancient capital of Assyria. According to the Urantia Book the Assyrians are the descendants of the Vanites. 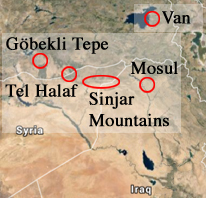 The Sinjar mountains are where the Yezidis escaped from ISIS. Just as an aside, the Yezidis are Kurdish and so is the shepard who discovered Göbekli Tepe. I suspect that what happened in those forgotten times has traces we can see today. First is the ancient religion of a small sect of religionists called the Yezidis who worship a form of Lucifer, the Peacock Angel. This is the world's oldest religion and in 2012, by their calendar, year 1 dates to 4750 BC back to the time of the Elamites, Sumerians and Canaanites. Second is that Kurdish origin has been referred to as involving the Jinn, that is they are a mixture of Jinn, supernatural beings, with human women. That would be the exact description of a Nodite. Like the Nodites the Kurds seem to have been living in the same area for millennia. "Because the young virgins had “found favor in the eyes of the jinn, the jinn took them unto themselves as their wives. And they begot many beautiful children, and those children bore more children… And that is the way the nation of the Kurds came into being”. "It is related in histories, that a race of Jinn, in ancient times, before the creation of Adam, inhabited the earth, and covered it, the land and the sea, and the plains and the mountains; and the favours of God were multiplied upon them, and they had government, and prophecy, and religion, and law; but they transgressed and offended, and opposed their prophets, and made wickedness to abound in the earth; whereupon God, whose name be exalted, sent against them an army of Angels, who took possession of the earth, and drove away the Jinn to the regions of the islands, and made many of them prisoners... - Zakariya al-Qazwini, cosmographer"
"Whereas the Medes and the Persians were of one tribal root, the Elamites, the people of the southeast corner of the Mesopotamian plain were linguistically and racially Mesopotamian." The quote above needs some qualification. The mention that the Elamites were racially Mesopotamian is correct. They were Nodite. (The much later appearing Assyrians and Babylonians were Semites.) But linguistically they were different. Elamite is a language unto itself and is not connected to any other language and does not fall into any linguistic group known today. It is considered as a language isolate and so is Sumerian, Hurrian and Urartian. At the earliest time of the Babylonian empire the language that became the lingua franca of the land was the diplomatic language known as Akkadian (which displaced Sumerian). All diplomatic correspondence was written in it including those of the Elamites. However, the Elamites still wrote in their own language within Elam. From the time of Alexander the Great the use of cuneiform was being superseded by Aramaic which was in use at the time of the Jewish Exile. (During the 8th century BC the Assyrian emperor Tiglath-Pileser III introduced Aramaic as the lingua franca of their empire.) So, yes, the Elamites were linguistically Mesopotamian but only through the diplomatic language that was prevalent at the time. What this shows is that Elam, Sumeria, Babylonia and Assyria had direct communication through a common language and it allowed as well for a cultural exchange. And by the way all four at one time or another were trading partners as well as enemies. "The first known inscriptions of Aramaic date to the late tenth or early ninth century B.C. In a phenomenal wave of expansion, Aramaic spread over Palestine and Syria and large tracts of Asia and Egypt, replacing many languages, including Akkadian and Hebrew. For about one thousand years it served as the official and written language of the Near East, officially beginning with the conquests of the Assyrian Empire, which had adopted Aramaic as its official language, replacing Akkadian. "During the later Chaldean (Neo-Babylonian) and Persian conquests, Aramaic had become the international medium of exchange. Despite Hellenistic influences, especially in the cities, that followed the conquests of Alexander the Great of Macedonia, Aramaic remained the vernacular of the conquered peoples in the Holy Land, Syria, Mesopotamia and the adjacent countries. It ceded only to Arabic in the ninth century A.D., two full centuries after the Islamic conquests of Damascus in 633, and Jerusalem in 635. Aramaic has never been totally supplanted by Arabic. Aramaic had been adopted by the deported Israelites of Transjordan, exiled from Bashan and Gilead in 732 B.C. by Tiglath-Pileser III, the tribes of the Northern Kingdom by Sargon II who took Samaria in 721, and the two tribes of the Southern Kingdom of Judah who were taken into captivity to Babylon by Nebuchadnezzar in 587. Hence, the Jews who returned from the Babylonian Captivity brought Aramaic back with them to the Holy Land, and this continued to be their native tongue throughout the lifetime of Eshoo Mshikha." "At Babylon Daniel and his companions had to acquire “the learning and the tongue of the Chaldeans,” that is, their ancient literature and language (Dan. 1:4). The question is what was that language? In Daniel 2:4 we find that the wise men answered the king in the Syriac language, that is Aramaic: (Compare Ezra 4:7)." This refers to the Babylonian Exile and the year that the above quote refers to is 606 BC, which is at the very beginning of the Jewish Exile (per footnote The Oxford Annotated Bible). By this time the lingua franca, the diplomatic language between differing native speakers, is Aramaic. In the verses of Daniel 1:1-5 are the instructions of the king, Nebuchadnezzar, to teach the children (and adults) the language of the Chaldeans called Chaldaic which at this late date for Babylonia was a dialect of Aramaic. As to whether Nebuchadnezzar was a Chaldean in an ethnic sense is not clear but the dynasty of his reign was Chaldean. Abraham was a Chaldean but you already knew that. The Book of 1 Enoch would have been written in Aramaic which points to its most likely source: Babylon. Although there are no surviving copies of the book in Aramaic fragments of the book from the Dead Sea Scrolls are written in it. What the Babylonians did not know at this time was that in about seventy years the great city of Babylon would be sacked by the Achaemenid Persians and never to rise to its former glory. What precedes Babylonia in connection with part of the Book of 1 Enoch can only be conjuncture but it is my belief that it came from Elam with Edenic influences rather than from the Assyrians or elsewhere. It is unfortunate that we do not have a better understanding of the writings from Elam. 2 sons of God saw that the daughters of men were beautiful, and they married any of them they chose. 4 The Nephilim were on the earth in those days - and also afterward - when the sons of God went to the daughters of men and had children by them. They were the heroes of old, the men of renown." 1 And it came to pass when the children of men began to multiply on the face of the earth and daughters were born unto them, that the angels of God saw them on a certain year of this jubilee, that they were beautiful to look upon; and they took themselves wives of all whom they chose, and they bare unto them sons and they were giants. 2 And lawlessness increased on the earth and all flesh corrupted its way, alike men and cattle and beasts and birds and everything that walks on the earth -all of them corrupted their ways and their orders, and they began to devour each other, and lawlessness increased on the earth and every imagination of the thoughts of all men (was) thus evil continually. And it came to pass when the sons of men began to multiply on the face of the ground, and beautiful daughters were born to them, that the sons of the great ones saw that the daughters of men were beautiful, with eyes painted and hair curled, walking in nakedness of flesh, and they conceived lustful thoughts; and they took them wives of all they chose...Shamhazai and Azazel fell from heaven and were on the earth in those days, and also after that, when the sons of the great ones came in unto the daughters of men, and they bare children to them: the same are called men of the world, the men of renown. There are two accounts of translation in the Bible, two who did not die and were taken "up to heaven." The Urantia Book and the Bible are in agreement on this including the mention of the four and twenty counselors. "36 And when the kings returned they caused a census to be taken, in order to know the number of remaining men that went with Enoch; and it was upon the seventh day that Enoch ascended into heaven in a whirlwind, with horses and chariots of fire. There were multiple groups that had a role to play in the perpetuation of memory of these epic and protohistoric events both conserved within and dispersed beyond Mesopotamia. Nodites:First would be the Nodites a people whose earliest roots were in the semi divine. Genetically the Nodites were a mixture of who we call the Watchers and the evolutionary races. We today refer to the Nodites as the Nephilim. They never totally forgot their origin and that olden glory was remembered for half a million years. (Also see: Ratta UB 861) One thing to consider is that the human population for almost that entire time frame was relatively small. (Population growth charts are usually flat lined until approaching 2000-1000 BC.) That scale of population helped keep the passing on of their history and traditions concentrated and intact. Also it appears they did not migrate out of Mesopotamia to any large degree. The Nodites did have settlements in the then dry Mediterranean basin and some migration into Turkmenistan but that appears to be the extent of any movement away from their homeland. The Amadonites were Andonites named after Amadon the human companion of Van who stayed loyal to him. From this group were a number of those who were associated with the Calagastia 100. They were contributers to the bodies of the 100 by donating genetic material for the cause thereby helping to establish human bodies for the celestials with the ability to procreate. In return they received the complement of the system life force which allowed them to live on indefinitely by eating from the Tree of Life and that would make them a very special subgroup of Andonites. That puts the total of around 200 beings who were sustained by the Tree of life. The term Vanites is for those northern Nodites forsaking very early on Nod's leadership who mated with the postrebellion Amadonites and followed Van. (Amadonites see: UB 759, 822 & 860) Van and Amadon were sustained by the Tree of Life for all those following years. Van later would be called Enki by the Sumerians and Amadon as Isimud his minister and vizier. Because of the Lucifer Rebellion the Nodite forefathers were unable to sustain themselves indefinitely. Their connection was severed as a result of their choice to abandon the divine plan. That fate, the loss of immortality, also happened to Adam and Eve. These Vanites were as a group very important in keeping the original goals and memories of the 100 alive. It is this group that settled about the shores of Lake Van. There actually were four groups of Nodite centers. The fourth center is this northern group about Lake Van. If the Nodites never did migrate away from this region then after many millennia their mixed descendants became the Urartians through a collation of tribes that became dominant during their time of the Iron Age. The earlier separation into three groups (excepting the Vanites) came about because these original southern Nodites could not agree upon the building and dedication of the tower of Babel. The warfare was so intense that they almost decimated one another and I think that this is the source in Enoch of the great wrath of the giants and how they fell into combat with one another. It is the Palestinian tradition about the Nephilim that attributed to the such misunderstood gigantism. It is an Enochian tradition that found its way into the Bible. This war among the Nephilim also is recorded in the Quran but in terms of the war of the Jinn (who are not the Nephilim) which takes place in heaven and eventually is brought under control by the angels. The same supernatural play but with different actors. Adamites: Adam and Eve's progeny who lived on long after their death. The Adamites would also include the Sethite priests who carried forth the teachings of the Garden. Later Mesopotamian culture would embrace these teacher priests as the apkallu the keepers of the me, the arts and moral codes of civilization. The Mesopotamians also believed that they also had the power to protect and heal. More related information can be found on the page The Apkallu and The Gardens of Eden. Adamsonites: The children of Adamson and Ratta who became emissaries of Edenic culture are another group to perpetuate these ancient histories now called myths. They helped to extend the Andites further north into Turkmenistan, China, Russia and India. Andites: Because Adamic and Nodite blood mixed with evolutionary man the Andites appeared on the rim of the fertile crescent. They too knew of these histories, from both sides - the Garden and the rebellion, and were instrumental in influencing world culture with these same memories. It was the Andites who were the most restless during those very early times. By the time the Sumerians reinvented writing and were building cities they had become so mixed as to become Andites themselves. And with that goes all the afore mentioned history which shows up in their epics. Machiventa Melchizedek: And lastly we have Machiventa Melchizedek who volunteered to come to this planet at a time when the belief in the one God was disappearing. Before the arrival of Melchizedek all of this history is Mesopotamian. Melchizedek was instrumental in sending his Salem missionaries out into the world with the spiritual message of El Elyon, the Most High God. With this perspective you can see why deciphering what the Sumerians had to say, who almost came down to the times of Melchizedek, can be difficult to sort out. I still sometimes make mistakes as to whether a reference is from the times of the rebellion or from the times of Adam and Eve. The Sumerian texts speak to both the times of Dalamatia and of the Garden. Sometimes its a judgment call. One of the things that has come to impress me the most is this conservation of history by the Nodites. For me it began to become clear of their real place in all of this. That starts with my writing the page The Apkallu. Although the Sumerian viewpoint has a very strong Nodite influence, it does include what they knew of the Garden. Case in point: the apkallu. Oannes at least according to the Sumerian texts (as presented by Berossus a Greek Babylonian priest) is traced back to the first antediluvian city of Eridu. Since the Sumerians also attach the first king to it and by their reckoning of time it then dates back to the times of Dalamatia some 450,000 yeas ago. But the Sethite priesthood on this time scale is very recent - about 15,000 years ago and this priesthood is who the apkallu are based on. Thus there is a mingling of Nodite/Adamite traditions but not necessarily within parallel time frames and this is a common feature from the Sumerian epics. From the above list it is not apparent as to who contributed the most intact information, the Adamites, Adamsonites, Andites, Amandonites/Vanites or Nodites. This can be actually summed up in one word: migration. There were numerous migrations away from Mesopotamia starting with those from Adam and Eve's lineage which ran out during the time of the Sumerians and the Andites who moved out and away with sufficient speed to seed the other cultures of the world with the memory of those epic events. These migrations depleted the homeland of both original stock. The Vanites, those human followers of Van, were not located in southern Mesopotamia making their way to the area called Aratta by the Hebrews and Urartu by the archaeologists. Van himself had his headquarters in the foothills of the Kopet Dagh just southeast of the Caspian Sea where Adamson and Ratta would later raise their family. That leaves the Amadonites and the Nodites. Two really different people but who both have their roots in Dalamatia. Of these two groups the Nodites were the closest to Sumeria. If the Kurds are indeed descendants of the Nodites then we can match their earliest known history to the Halaf culture. The distribution of Halaf pottery matches almost exactly the territory of Kurdistan and the earliest date for this pottery is about 6000 BC the end of the Neolithic. Tel Halaf is located between the Tigris and Euphrates next to Turkey, east of Harran and southeast of Göbekli Tepe by about 75 miles or 120km. It would be in the vicinity of where the Urantia Book says the Syrian Nodites and Vanites settled. "Rather, Halaf pottery, often described as the finest prehistoric ware in Mesopotamia. is found from Lake Van in the north (and, in fact, Halaf ceramics are found in Transcaucasia according to P.L. Kohl), to the Mediterranean in the west, to beyond the Tigris in the east (Watson 1983). Remarkably, over this wide expanse, "Halaf [has been considered] one of the most homogeneous prehistoric cultures anywhere in the world." To paraphrase the Urantia Book: Jesus found a copy of 1 Enoch in the library of the synagogue at Nazareth. He knew it was not written by the Enoch of old but it intrigued him to read it where he discovered the term "Son of Man" and because of its context of God, salvation and a spiritual mission he adopted the title as his own. "There was an important historical event, back in the 4th century. It is called the Council of Laodicea. It changed history two significant ways. At this council they determined what would and would not be considered canon. They decided what would and would not be included in the Bible or read at church. (Canon #60.)" Enoch was one of the books banned at this council along with forty others including the first and second Book of Adam and Eve, The Testament of Reuben, Benjamin and The Apostles' Creed. What you see here are the Roman ruins of the city. 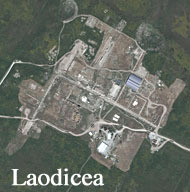 Laodicea was an early center of Christianity and has archaeological remains of some churches. It is most likely that the council met at one of these churches and not in the city itself. 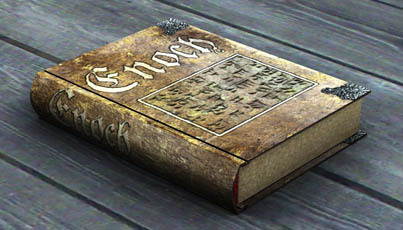 Banned, the Book of Enoch disappeared from history until it was rediscovered in Ethiopia by James Bruce. With all of this said the Book of 1 Enoch was not written by him, only attributed to him. But what it has to say is a statement on the ability to carry down from the time of the rebellion to the times of Mesopotamia the story of this epic event of the fallen, a feat that is almost beyond belief. What is unexpected is how true in some of its details the story is. I might add that I do think Enoch, the Enoch and his bloodline, may have a connection to the book concerning in the main that of the rebellion. It may be wishful thinking as it is impossible to say for sure but somebody is its origin. I have my reasons. It is quite evident that much of the book is not original to Enoch of old. The Noachic fragments could not possibly have been written by him thereby revealing that the story of the Watchers is attached to other authored material. The chapters on astronomy are most likely Babylonian. The mention of the Most High, a theological construct by Melchizedek, is long after Enoch but would have been before the Exile. Melchizedek introduced Abram to it in Genesis 14:19. The largest consensus is that it was a Palestinian Jew and most likely Hasidic who penned the book in Aramaic. Dates for it vary widely. That is because there is a difference of scholarly agreement as to when the various parts of the book were written and edited. This accuracy of recording ancient events is also reflected in the targum Pseudo-Jonathan. It too faithfully preserves the names of the two fallen angels Lucifer and Satan and that Lucifer the morning star in ancient times did walk upon the face of the earth. As for other apocrypha I do not have as high regard at least from what I have read. The first Book of Enoch though is in a league of its own.